All-Star Batman #11 Review – AiPT! Batman and Alfred’s adventure in Miami—complete with a look into Alfred’s past—continues. 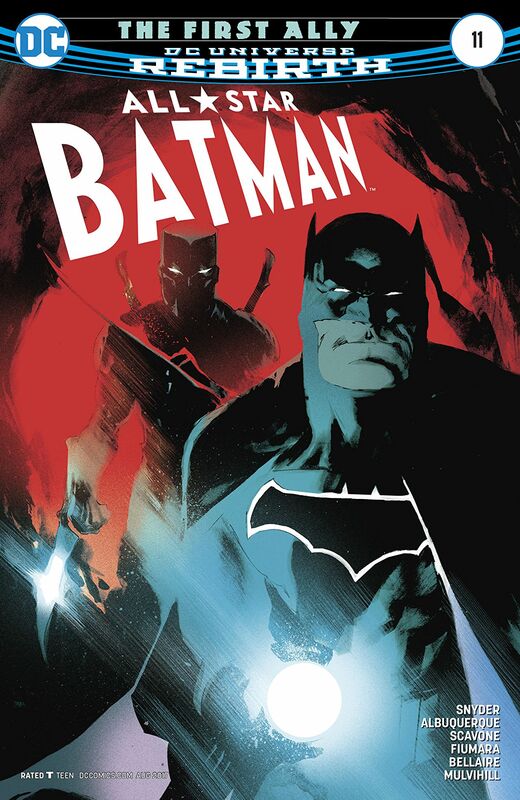 No matter how this issue turns out, Scott Snyder deserves a lot of credit for turning a plot point from the Batman & Robin movie into a cool narrative easter egg. Good thing ancient grappling hooks are so reliable. It took me a minute to realize that “winding clocks” wasn’t completely a metaphor. Gotta love it when a group of your rogues gallery decides they can use your help at just the right moment. An underwater submarine/casino sounds like a terrible idea. That being said, I’d totally want to check it out. Massive blood loss vs. water pressure-induced implosion: Pick your poison. I wanted to like this issue a lot more than I did. For starters, Raphael Albuquerque’s art is great. The guy is one of the best in the business at telling a story from one panel to the next. Story-wise, this one has a lot of great moments. The deep dive into Alfred’s past is not only fascinating, but serves the current story well, too. And there are multiple moments when it truly does seem as though Bruce Wayne’s life is genuinely in peril. We know he’s not going to die or anything, but it’s nice to have some doubt once in a while. Unfortunately, the aforementioned moments are facilitated by some fairly contrived circumstances. Whether it’s villains showing up at just the right time to offer unexpected aid or bad guys deciding multiple times not to finish off their target, the result is a good story that’s almost overshadowed by some glaring narrative issues. Other than that, though, All-Star Batman #11 is still a fun issue. The Alfred-centric portions alone are worth the price of admission. Add in a compelling Russian mafia backup story, and I’m almost able to forgive and forget about the main story’s plot issues. Let’s hope that those end up being a means to what turns out to be a spectacular end in the months to come. A fun and exciting issue that loses some of its luster due to a few glaring plot contrivances. Raphael Albuquerque’s art is great. The guy is one of the best in the business at telling a story from one panel to the next. The Alfred-centric portions of the issue alone are worth the price of admission. Whether it’s villains showing up at just the right time to offer unexpected aid or bad guys deciding multiple times not to finish off their target, the result is a good story that’s almost overshadowed by some glaring narrative issues.